Army Post Rd & Fleur Dr. Flying out of DSM Des Moines International Airport has never been easier. When you park your car at Jet Parking, we make sure that everything is taken care of. From our superior shuttle service, great customer service, and unbeatable location, you won't have to worry about anything. Our lot is accessible to you 24 hours a day, and offers secure parking with 24/7 surveillance. We offer a daily flat rate with no hidden fees or taxes. Not only are we less than 1 mile away from the airport, but we also provide worry-free shuttle transportation thats included with your parking reservation. With 2 shuttle buses to provide all your transportation needs, we don't leave you waiting. If for any reason you need to cancel your reservation, you can either log into your InstaPark account to manage all your parking reservation needs, or feel free to contact us at 866-888-0331 or email us via support+856@instapark.co and we will be happy to help assist you. We can provide full refunds all the way up until the day of your scheduled arrival. Area Army Post Rd & Fleur Dr. Please show your InstaPark reservation conformation upon arrival at the lot. Upon your return Please call 1-515-402-8206 For Return Shuttle service, and let them know you wish to be picked up. Very good experience, nice and simple. I will use them again next year. Was very good would do again if needed! I arrived and the gate was open, but no-one around--granted it was 3:30 am. I had no idea what to do as this was my first time using this parking. Shuttle finally came and he told me to park.Driver grumbled all the way. Parking area was not cleared well at all. Return pick up worked well--again a grumpy driver. Yes, it was 12:30 AM, but if he's working then, he needs to hold his complaints to himself. Won't use this parking again. The gentleman who picked us up Monday night at 11 p m from Des Moines airport was the best!!!! So helpful with our luggage and getting the ice off the car window, in the frigid cold! He was absolutely great! Thank you! We will highly recommend! Made reservation and prepaid on 11/21 but lot was full when we arrived. Had to find another lot. Requested refund right away but still have not received it. Flight leaving was early in morning. Van was in lot at 4-4:30 am to take me to airport! When I got back from traveling called and van was out front waiting for me! This was great! Will use again. Very convenient. Especially with your shuttle van. Made our trip easier. Easy access. Pick you right up once you call them to and from the airport. Very very polite. Top notch service! Friendly and prompt! This is a easy way to close parking at the Des Moines airport, quick pick up. Our experience with Jet park was excellent. We would use them again in the future. This is my second time parking here. It's convenient, the drivers are friendly, and I can trust my car will be there when I get back. Jet Parking will be the only place we park our car in the future when we are flying from DSM airport. Highly recommend. What do I have to say about Jet Parking? I'd say that they're the best! Top notch service, facility, and company. I'll be using them again and again. Wonderful off-site airport parking lot that has staff who care about their customers. Thanks for everything, I'll be back again. These guys get 5 stars from me! They gave me exceptional service all around. Will use Jet Parking again. My flight was delayed before we even left the house so I called Jet Parking where I was leaving my car to change my check-in time. The woman I spoke with was great, she made the change no problem and even said that all I needed to do was show up with 20-30 minutes to spare and they would make sure I got where I needed to go in time. Jet Parking is by far the best off-site long-term parking lot that services Des Moines Airport. Strongly recommend using the next time you fly. Everything with Jet Parking is simple, check in and out, the shuttle to and from the airport and finding it too! We will recommend it in the future. I'll be recommending Jet Parking in the future. Both drop off and pick up are fast and easy so is check in and out. My car was waiting for me when I got back to the lot from my trip too! One of the better long-term lots out there today. We just used Jet Parking to store our car when we recently went on a vacation. I have to admit that I was nervous at first but was easily put at ease when I met the people who work for Jet. They are all great! We will use them again for sure! Jet Parking is a good lot, with great prices and friendly staff. Highly recommend you check them out. Thank you, thank you, a million times, thank you! What an experience we've had with Jet Parking! Talk about caring about their customers. From the minute we stopped at the check-in counter our entire experience gets a top rating. Everyone was fabulous and made sure that we got to the airport quickly leaving us with tons of time to spare before our flight. We have tried several of the 'other guys' in the past and haven't ever really been satisfied with any of them until we found Jet Parking. Well lit lot, friendly and helpful staff and it's so close to the airport too. 5-star rating from both of us! We were traveling with two kids under three, two car seats and luggage but the shuttle driver a Jet Parking took all of the stress of this away from us instantly. He loaded everything into the shuttle quickly and without a complaint and then when we got to the airport unloaded everything as well. Not only that but got us as close to our airline check-in desk as possible to make things easier for us. Thanks, Jet, we will use you again. Traveling in the middle of the night is usually difficult for reasons no one thinks of but Jet Parking makes all of your troubles melt away. The shuttle service is quick, the drivers are super helpful and the parking rate is more than reasonable. Will be recommending to friends and family. The Jet parking lot is well lit and completely taken care of 24 hours a day with surveillance cameras that are manned at all times. My entire vacation was made far more enjoyable knowing someone was taking good care of my car at all times. I highly recommend Jet Parking! Jet Parking is the best! I had to cancel your reservation which was so easy to do. You can either cancel online or you can contact the toll-free number and speak to a customer service rep. I felt more comfortable talking to a real person so I called them instead. The woman I spoke with helped me rebook without a problem. Worked out really well. They do a good job. Our experience with Jet Parking was unbelievably awesome! We lost our receipt that they give you when you check in but it wasn't a hassle at all, it took a few more minutes to check out but the gentleman behind the desk found the information he needed and with a few things to verify that we were the owners of the car we paid and were on our way! 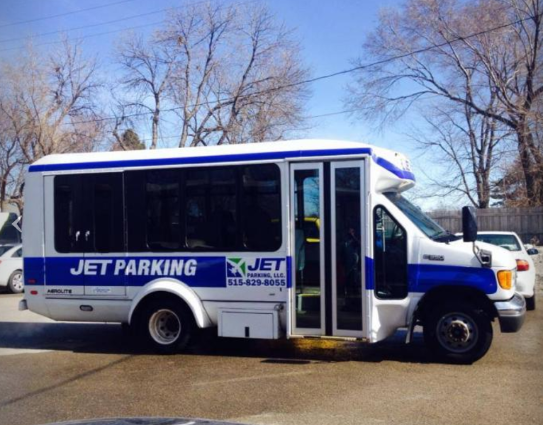 Jet Parking has 2 shuttle buses to provide constant trips to Des Moines airport so you won't be left waiting. The entire staff is great! I even forgot my cell in my car and the shuttle driver rushed me back to the Jet parking lot so I could grab it and we still had time to spare. Thank you so much for going that extra step to ensure we had a great vacation. Jet Parking is open 24 hours a day and is 100% secure with excellent surveillance at all times. They have a daily flat rate with no hidden fees or extra taxes. The added bonus is that it's less than a mile away from DSM airport. The shuttle service is prompt and included in your daily flat fee. Flying from DSM airport in Des Moines has never been easier! When you park with Jet Parking they take care of everything. The shuttle service is the best we've used yet. The location is great, the customer service is stellar and your car will be safe while you're away. Using Jet Parking is as easy as counting 1, 2, 3. Everything from the drop off to the pick up is smooth as pie. I will be recommending them to family and friends to use in the future. Thank you! This was my first time to use Jet Parking. The lot was easy to find and get checked in, even though I was there ridiculously early in the morning. Pick up went great. I called as I was getting my bags and the shuttle arrived maybe a minute after I got out to the shuttle pick up area. I'll definitely use them again. Jet Parking is great! We will totally use them again in the future, the price is more than reasonable. Both the counter staff and the shuttle driver were patient and accommodating to us traveling with our dog. It does take extra time to travel with him and no one that we dealt with seemed to have a problem with it. 5 stars all around! Traveling can be stressful at the best of times but not when you park with Jet Parking. Paying and checking out when we got back from our trip was so quick! I'd recommend Jet Parking 1000%! Everything from the first interaction to my last one was spot on. I'm looking forward to using them again. I've read several reviews for Jet Parking online, that's what made me book with them. I couldn't agree more with everything that I've read. Thank you to Jet Parking for taking such good care of my car while I was away. Parking at Jet Parking is always great! It's nice to finally have found a place to park that doesn't cost too much and delivers exactly what it says that it's going to. I'd give this place 3 stars overall. Jet Parking is a great place to park, the shuttle drivers are all nice and helpful with our luggage. We will park there again the next time we travel. The only thing that wasn't as great was our check out. Our customer service wasn't the greatest, it seemed as though the lady behind the desk didn't want to be there. Yet again Jet Parking came through for me in a pinch. I needed to fly out for work last minute and I didn't have a place to park. Found Jet Parking online, they still had room and I made the reservation in a few minutes for later that same day. When I showed up to park, they were expecting me and everything ran smoothly. We were more than impressed with the Jet parking lot near DSM airport. The shuttles run in a timely manner both to and from the airport, there are no hidden fees and the daily rate to park there is VERY reasonable. I've used Jet Parking now more than a dozen times as I travel for work a lot. The staff here has never let me down. The price is great and my car is always exactly as how I left it before my trip. Thank you for making all of my business travel much less stressful. When you first get to Jet Parking all you need to worry about is parking and checking in, you pay when you get back from your vacation. What's great about this is you can be on your way to the airport in only a few minutes. Jet Parking worked out for me when I was looking for long-term parking. I was on time for my flight and knew my car was safe for the duration of my trip. Jet Parking gets my stamp of approval. Jet Parking is tops! I forgot one of our bags in our car and didn't notice until we were unloading at the airport. Our shuttle driver drove back to the lot and not only did he grab the bag but he also made it in record time. Talk about customer service! Love these guys! 5 plus, plus stars! I just got back from another business trip and again I'm a happy man. I will continue to use Jet Parking every time I travel for both business and pleasure. I know my car is always safe and I trust the staff more than I do at any other lot. Thanks for a job well done once again. Jet Parking is very conveniently located at 5921 Fleur Drive which is less than a mile from the airport making the shuttle ride short as well. The daily rates are better than any other we have found too. Highly recommended by both myself and my husband. I did a lot of research looking for a long-term parking company that I was going to be comfortable with leaving my car. So glad that I chose to use Jet Parking because the service was outstanding. I think this will be my first choice from now on whenever we fly out of DSM airport. Thank you, thank you, thank you for going above and beyond to all of the staff at Jet Parking. Making a reservation online is so fast and makes things really easy when you arrive at Jet Parking. With our pre-booked reservation, we were on our way to the airport in minutes. Even coming home was easy, all we had to do was contact Jet when were grabbing our bags and they were there to take us to our car by the time we got out of the airport. We will recommend this company in the future to all of our family and friends too! Jet Parking - DSM - Des Moines Airport is fairly easy to find. My flight for my business trip was early on a Monday morning so it wasn't a problem finding a spot to park. The shuttle service was free to use, is only a few minute drive and you don't typically have to wait too long for the shuttle itself. Highly recommended. We made our reservation online in advance to make sure that we had parking sorted out before our trip )one less thing to have to worry about) and I'm so glad that we did! Everything went off without a hitch. We didn't have to worry about our car while we were enjoying our holiday. Thanks to Jet Parking for taking care of our car. I'll never use any other off-site airport parking lot from now on. My recent experience with Jet Parking was simply wonderful right from the start. The lot is clean, the staff is knowledgeable and fast and the rates are the best I've found yet. Highly recommend using Jet Parking. Jet Parking is great! These guys are the most reliable off-site parking lot that I've ever come across. The entire staff is professional and happy while they are working, they come across as actually enjoying their jobs. Don't forget about the great rates and the great location too! Thanks again Jet! Quick transport to and from the airport, the lot is well lit, safe and cheap too. I've tried several other parking lots around the airport in the past but Jet Parking is going to be my go-to from now on. I'll also be recommending it to everyone I know is traveling out of DSM airport. We have been using Jet Parking for quite some time now and have to say that they are very professional they have won me over as a customer after having a terrible experience with a nearby competitor. Thank you for taking me without a reservation and making sure that everything worked out. First time using Jet Parking. My daughter and I both loved it. Great service and fast too, it only took a few minutes to load our bags and then we were off to the airport. The way back was just as great even though we were a day later than expected due to a flight delay. We plan to use for our next family vacation with the whole crew this time. When we arrived home and got to the baggage carousel I called Jet Parking for a shuttle to come pick us up. The shuttle was there in minutes and our bags were quickly loaded into it. We were back at the lot and on our way home in less than a half an hour. We will use this company again! Jet Parking is a very efficient service which was well worth it. It's CHEAP to use, the cheapest off-site airport parking there is. I wouldn't hesitate to use Jet again. I arrived at the Jet Parking - DSM - Des Moines Airport and was immediately greeted by a friendly lot attendant. Although a shuttle left as I was getting ready to leave for the airport there was another one right there waiting to load up my luggage and help me on my way. The guys and gals at Jet Parking are the best long-term parking lot team out there! The service was fast, polite and very professional. Two thumbs way up from this gal! I really wanted to give credit to Jet Parking. Everything runs smoothly here. From the minute you pull into the lot until you check out after your trip everything is taken care of for you. Thank you Jet Parking staff, you're wonderful! Rated 10/10! I would go back to Jet Parking again in a heartbeat. We were a large group traveling together and they quickly accommodated all three cars and the travelers in them too. We were all dropped off at the airport with tons of time to spare. Thanks so much for working with us! Parking with Jet Parking was far better than either my wife or I expected it to be. The gentleman working at the check-in counter was very patient and helpful. Once checked in we grabbed the shuttle right outside the door and were headed to the airport in less than 10 minutes. When we arrived back at the airport I called them as we were headed to grab our luggage and the shuttle was there to pick us up when got out of the airport. Highly suggest checking them out. I highly recommend using Jet Parking - DSM - Des Moines Airport and will use them again for sure. Even the manager went out of his way to help us get on our way. He loaded our luggage onto the shuttle personally to help speed things along, which was a nice touch. Thanks for everything, we will see for our next vacation. The service and convenience of using Jet Parking can't be beat. The lot is less than a mile from the Des Moines airport which makes the shuttle ride less than 5 minutes. Both drop off and pick up at the airport was also fantastic, the driver helped to load and unload our luggage which was super helpful too! Using Jet Parking is easy peasy! We booked our reservation online in advance. Drove to the lot and were parked and checked in within a few minutes. Hopped onto the shuttle and were dropped off at the airport terminal close our check-in spot, which was great. On the way home our pick up was just as speedy with no problems there either. Highly recommend using Jet Parking. We came back from our amazing vacation after a very long flight delay and caught the shuttle without waiting at the airport at all. When we got back to the lot our car wouldn't start, it had a dead battery. The staff at Jet Parking helped to boost us and get us on our way in just a few minutes. Thank you to the wonderful staff who took such good care of us, we can't thank you enough! I would definitely use Jet Parking again and again. The service was great! I was on the shuttle to the airport in less than 10 minutes and when I returned after my week's vacation I was picked up within 10 minutes. The daily rate is the best around too! Amazing! Jet Parking is so close to the airport, the transport to and from the lot is really fast and there's no other lot that is going to beat the price! When we returned from our trip we were on our way home quickly and without a problem. 5 stars for sure, much better than any other lot out there. We just used Jet Parking and can't say enough good things about it. Our car was returned in the same condition we left it in. We had left our cell phones in the glove compartment when we left for our vacation and they were still there when we got back. Nice company, we will use them again. We parked in the Jet Parking lot over Thanksgiving when we were off to visit family in New York City. It was busy for the holiday but we still were given the best treatment from all of the staff members that we dealt with. I highly recommend checking them out! The service that you get when you use Jet Parking - DSM - Des Moines Airport makes all of the difference. Jet parking makes for an enjoyable experience every single time. I will continue to use these guys in the future and have already had several friends and family use them too without incident. We have repeatedly used Jet Parking without a problem. Both pickup and drop off have always run smoothly. Location is excellent, very close to the airport. Check in and out is always done in minutes. Will continue to use for future travels. Jet Parking is the only long-term parking lot that I will use. There seems to always be a shuttle ready to take you to the airport and pick you up and your car is always ready for you when you return. I highly recommend checking these guys out the next time you need to long-term park your car. I use this service every time I travel for work. It's really close to the airport which makes it super convenient. Never had a problem, the rates are decent and the staff are helpful every step of the way. I will continue to use Jet Parking when flying out of Des Moines airport. The price to park at Jet Parking is really decent! The time it took to get our car back from the lot could have been quicker but still great service overall. 4-star rating overall. We had a great experience with Jet Parking! Dropping off the car was quick and easy and we were headed to the airport in no time. Our return home was not quite as quick but still completely acceptable. We will use Jet again and from now on! The price for parking at Jet Parking - DSM - Des Moines Airport is so CHEAP! What makes this lot even better is that the staff is great and really go that extra step for you! I will recommend Jet Parking from now on! Thanks so much for everything! Thank you, Jet Parking for what started out as a stress vacation into one where we could actually relax from the moment we spoke with your customer service rep. We couldn't find the off-site airport parking that we had made a reservation for so we pull into Jet Parking and they took care of us right away with no question. Jet is now our go to and we've told everyone we can about how great everyone is too! Thanks again! Jet Parking is wonderful! The woman working behind the desk was great and very knowledgeable. We were VERY early for our flight so she suggested a restaurant nearby for us to check out before we made our way over to the airport. The restaurant was awesome! Once we were done we headed back to Jet and they took us and our bags to the airport right away. Two thumbs way, way up from us! This was our first time using Jet Parking and it was so worth it. The shuttle service was outstanding - fast, friendly and easy to use. We have already recommended Jet Parking - DSM - Des Moines Airport to several of our friends who have been traveling out of DSM airport. We use Jet Parking whenever we fly out of Des Moines airport.We like every aspect of the service that we always receive. The shuttle is crazy fast and it's less than a mile away from the airport which has helped us a lot in the past when we were running late. These are the guys to use for sure! Jet Parking - DSM - Des Moines Airport is great for frequent travelers because they actually truly take care of you. The lot is clean and 100% secure at all times. The staff have become like family to us we have used them so much now. We love Jet Parking and so will anyone else who uses them. I love that my car was completely safe while I was away on a trip with my sister. I didn't have to worry about a thing because Jet Parking has 24-hour surveillance cameras and staff to actually make sure that the cameras are doing their job. Jet will be my go to from now on when I need long-term parking near the airport. 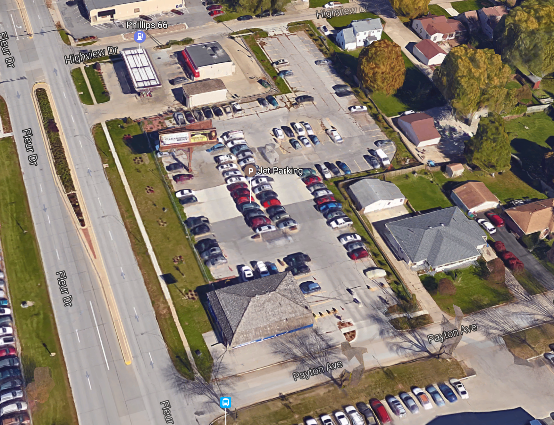 Jet Parking Des Moines Airport is very conveniently located less than a mile away from the airport. It's easy to find with the directions that are given on the airport and all of the staff who work there really seem to want to make sure that you are left stress free while you're away on vacation. Jet Parking offers a flat rate with no hidden fees. It's easy to find and located less than a minute drive to the airport. The shuttle drivers are kind and always willing to help to make sure you have a seamless start to your vacation. You get exactly what you need with Jet Parking - DSM - Des Moines Airport. It's worth using for the cheap rates, the friendly staff and the frequent shuttle rides to the airport that is close by. No need to pay high rates to get the same thing here.Highly recommend checking them out. Finding a long-term parking lot to store my car while I was away for two weeks was a bit stressful at first but then I found Jet Parking! These guys are great! They have 24 security at all times, the lot is clean and the staff will answer all of your questions without a problem. Overall I am very happy with the services that I received from Jet Parking - DSM - Des Moines Airport. It's cheap, the staff is the best I've dealt with in quite some time and the lot is secure when I'm not there! We had two different shuttle drivers on the way to the Des Moines Airport and back to the Jet Parking lot when we got home from our vacation and both were phenomenal! They were friendly, insisted that they load the bags into the shuttle for us and they were speedy too! Thanks to our driver on the way there to making us on time when we were stressed that we were late! It's crazy easy to make your reservation for Jet Parking. Literally, within a few minutes, you'll be good to go and you don't have to worry about a thing. The staff is great, it has 24-hour security, the lot is clean and it has one of the cheapest daily rates you'll ever see. Time to check these guys out. This off-site airport long-term parking lot was great! Jet Parking - DSM - Des Moines Airport is the place to park your car when you want to make sure that it will be well taken care of the entire time that you're away on your vacation. Highly recommended! Unfortunately, we returned from our trip on a day where one of the shuttle vehicles had broken down just as we landed so we ended up having to wait a bit longer for a shuttle ride back to the parking lot. The staff did acknowledge this and made it right by giving me a discount for my parking. We will use Jet Parking again as everything else really was great! Jet Parking has very friendly staff who are looking to make sure you have a great start and end of your vacation. We have sued them 6 times now in just over a year and every time has been great! We will use them again! Everything was wonderful at check-in, it was fast, the staff was expecting us and the shuttle driver was amazing. Our only complaint would be that it took about 25 minutes for the shuttle to pick us up from the airport when we got back. Jet Parking is worth checking out for sure! Jet Parking offers good service by friendly and professional employees. There was a little bit of a wait on the pickup when we returned but not too long at all. Thanks again to the wonderful staff at Jet Parking - DSM - Des Moines Airport for taking care of us. Good service, very professional and kind employees at Jet Parking. We waited slightly at the airport when we got back from our trip for a shuttle but only for about 10 minutes which was odd since there were several shuttles running as it was the middle of the day. Other than that we had a good experience and we will use them again. We found that all of our interactions with Jet Parking were prompt, helpful and geared towards making sure our vacation was stress-free. We've used them in the past and will continue to do so in the future. Thanks again for making sure our car was well taken care of while we were away! The staff that works at Jet Parking were very professional and quite organized. They quickly helped me when I arrived. Upon my return, I was disappointed to find out that I still had to pay taxes upon my fee that I was originally quoted, not a big deal and I should have expected it but I did think that this fee was already included in the total I was quoted before I left on my trip. Great cost! Convenient and reliable service. Would definitely use again! The parking is reasonably priced and secure. The shuttle and shuttle drivers were great also! Fast, quick, efficient, affordable, right next to the airport! Friendly staff, clean and safe parking lot and reasonable prices. Thank you Jet parking for making travel so easy!